The town of Orleans is located just below Eastham at the base of the narrow forearm of the peninsula that is generally referred to as the Outer Cape. Orleans has several beaches, including Skaket Beach on the Bay, and the beach at Pilgrim Lake, a freshwater pond. Yet the main reason to visit Orleans would be Nauset Beach on the Atlantic—the southern most of the beaches in the Cape Cod National Seashore. Nauset is one of the most popular beaches on the Cape for surfers and sunbathers alike; as such it is usually quite crowded. The beach is ten miles long, however, so you don’t have to walk far from the parking lot, snack bar, and gazebo to escape the crowds if you so desire. 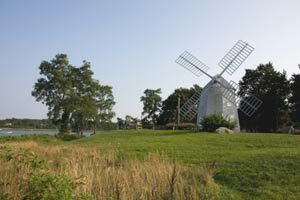 In town, Orleans is more spread out than its smaller neighbors, and also serves as the commerical hub for the Lower/Outer Cape. It does have charms beyond the beaches, though, as does each of the unique towns on the Cape. Every August, Orleans hosts the “Pops in the Park” concert, featuring the Cape Cod Symphony Orchestra, and the gazebo at Nauset Beach hosts free evening concerts in July and August. There is good kayaking to be had around Little Pleasant Bay and Hog Island, and there are ample opportunities for fresh and salt water fishing. One of the restaurants in town, Abba, is also a good bet if you are looking for an evening of fine dining without the ubiquitous lobster bib.